I love simple wedding cakes. And if that simple wedding cake happens to be a chocolate wedding cake that’s even better! 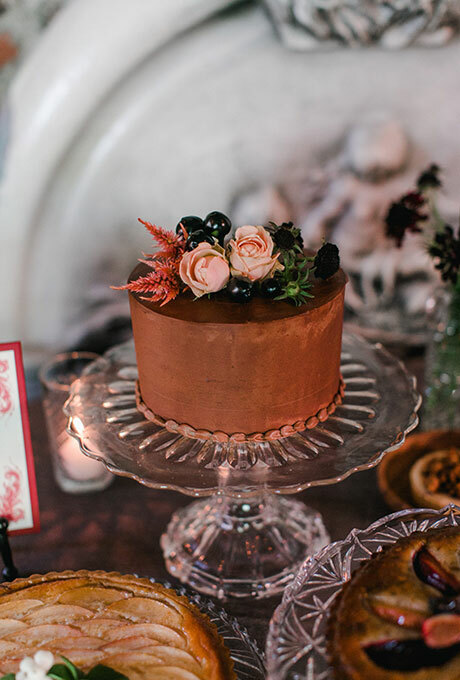 This one-tier chocolate cake would be ideal for a small, intimate reception. Or it would be great if the bride and groom want to have their own cake while letting the guests enjoy a dessert bar filled with sweet treats like candy, cupcakes, or even mini cakes. The cakes features a simple but elegant chocolate icing and minimal decoration on top – just a few berries and fresh flowers. You could skip the flowers and do a small, elegant cake topper. Or nothing at all. No matter how you slice it you can’t go wrong with this chocolate wedding cake. You can find this cake here. It was created by Marcrina Bakery.